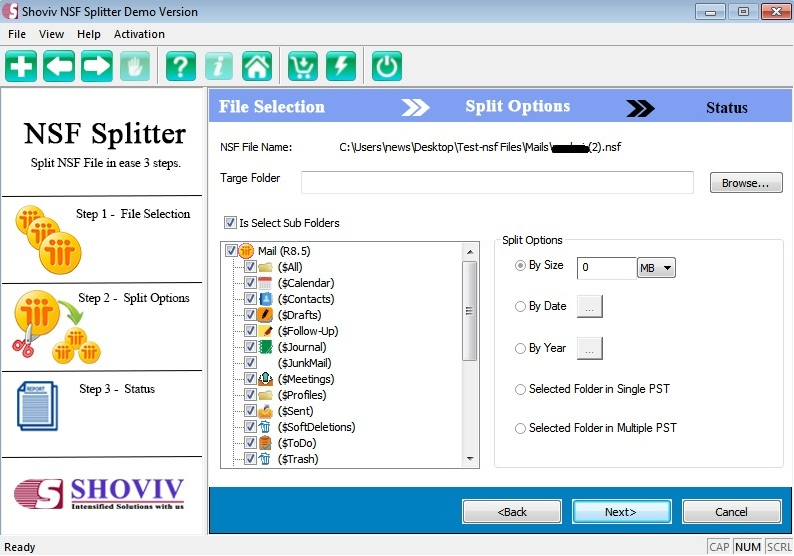 Shoviv NSF Splitter Software allows the users to split large NSF file into multiple small NSF files as per the need such as Split by Date, by year and by time. Shoviv NSF Splitter software works smoothly with large NSF file to split into small NSF files without losing any data. Shoviv NSF Splitter tool has user friendly Graphical User Interface (GUI) which makes NSF splitting process quite easy for even those users who seems non-technical. With Raise Data Recovery for UFS/UFS2 you can access and recover files from UFS and UFS2-formatted disks, find and recover data from UFS/UFS2 partitions that where lost after disk re-formatting, re-partitioning or partition table crash. The Kernel for SQL Server is a proficient software utility that repairs corrupted or damaged database with utmost accuracy and precision. Recover My iPod will recover deleted or lost iPod files. Recover a frozen iPod, recover from an iPod reset, recover from an iPod Restore, or recover iPod files from an iPod "sad face" or exclamation mark icon. Easy to use. Try it now. Stellar Phoenix DB2 Recovery is designed for Windows 2003, XP and 2000 operating systems. The DB2 repair tool comes with highly interactive user documentation, which makes it easy to understand without any prior technical understanding. DataNumen TAR Repair(formerly DataNumen TAR Repair) is a powerful tool to repair corrupt TAR files. It can scan the TAR archives and recover your data in them as much as possible, so to minimize the loss in file corruption.